So be careful if you ever need to use them inside your calculations! Personally I’ve never done much with dynamic named sets at all, but Mosha has of course blogged extensively about several ways they can be useful. The last non empty semi-additive measure aggregation functionality in SSAS enterprise edition is very useful, but it doesn’t support one common business requirement: while it will give you the last non empty value within any given time period, it doesn’t handle the variation where you want to get the last non empty value of a measure from all preceding time periods (this is what I’m calling the ‘last ever non empty’ value). There are a number of business scenarios where you’d want to do this, for example finding the value of the last purchase a customer made, the last price you sold a product at, and the stock level of a product in a shop the last time a sales rep visited. Traditional MDX solutions to this problem have suffered from poor performance but in this blog post I’ll describe a new approach that performs much better; I think it will be very useful to a lot of people, and I’m quite proud of it! First of all the DaysToDate measure returns the zero-based index of the current date within the set of all dates, so the first date in the time dimension would have index 0, the second 1 and so on. This could be replaced by a real measure to get slightly better performance but I left it as a calculated measure for the sake of clarity. 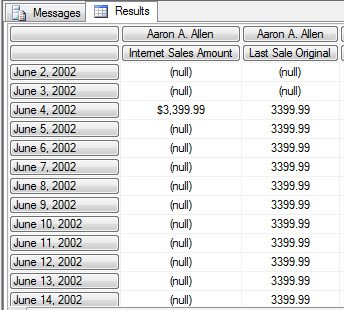 Next, the measure HadSale returns the index of the current date if it has a value and null otherwise. Next, the measure MaxDate returns the maximum value of HadSale for the set of all dates from the beginning of time up to the current date. This will give us the index of the last date which had a value. Finally we can take this index and, using the Item function, get the value of Internet Sales Amount for the last date that had a value. First of all, you need to create a new column in your fact table that contains only null values and use this as the basis of a new real (ie not calculated) measure, which should be called MaxDate. This should have the aggregation function Max. I’ve finally got round to organising a two-day public MDX course, to be held in the UK, in central London on the 12th and 13th of May. It’s the standard ‘Introduction to MDX’ course that I’ve been teaching for several years now as a private course (indeed I’ve given it five or six times already this year) and aims to take you from the point of being a complete beginner with no previous knowledge of MDX up to the point where you can write 90% of the MDX calculations and queries you’ll ever need to write. What is MDX and why should I use it? The cost is £499 plus VAT, including lunch and drinks/snacks. There will be some practical exercises but to do them you’ll need to bring your own laptop with SSAS and Adventure Works on – I’m not providing any PCs. You’ll notice that TEST1 and TEST2 are essentially the same calculation, as are TEST3 and TEST4; the only difference between them is that the set expressions in TEST1 and TEST3 have been replaced by references to the named set ALLCUSTS in TEST2 and TEST4. On my machine the query with TEST1 took 874ms to run; the query with TEST2 took 6302ms; the query with TEST3 took 234ms; and the query with TEST4 I ended up killing after a few minutes. So, clearly, as the article says referencing a named set inside one of the MDX aggregation functions in a calculation is a Very Bad Thing for performance and something to be avoided at all costs. While it might seem an appealing thing to do for readability, the downsides are significant. Sorry for the relative quiet on here recently, I’ve been caught up with helping to organise SQLBits and other stuff… But anyway, this week I’m working with a company who asked me to tackle what must be a very common business problem: they have a fact table where one row represents an invoice they have generated, and they need to know at any point in time what the average age of all their unpaid invoices is, and monitor whether this value goes up or down. The point of this is, of course, is that if the average age of outstanding invoices starts to go up over time then it means that their customers are getting slower to pay them and they may potentially have a cashflow problem. In the real world some invoices will be unpaid when the fact table is loaded, others will be paid. We need to be able to handle both scenarios properly. I’ve filtered the fact table to remove a very small number of rows where PromotionKey is less than 3 – this will give us a few unpaid invoices to make the numbers more interesting. I’ve created a new date key called PaidDateKey to make the invoices have different payment lengths. Because these are paid invoices, we know how long they took to be paid and we can precalculate this and put it in the fact table in the DaysToPayment column. We can now build the cube. It needs two measure groups, one based on each fact table, and we can add the Customer dimension too. Three measures need to be built: one count measure on each measure group and a sum measure on the DaysToPayment column. The Date dimension joins to the OrderDateKey on the All Invoices measure group, and to the PaidDateKey on the Paid Invoices measure group. Find the total up to yesterday of the [Unpaid Invoices Count] measure. This gives the total number of days that every invoice has ever been open. I only wish I could come up with a way of getting some of my customers to pay this quickly…! I’m speaking on the Friday – a session on scoped assignments in MDX – along with many other SQL Server experts from around the world. If you’d like to come you’ll need to register quick though, since we’ll be full soon! Don’t forget there’s also our new event, SQLBits Insight, for CIOs, technical architects and senior IT decision makers taking place on April 7th too. The big draw is the opportunity to meet Steve Wozniak but we’ve also got some great speakers from Microsoft too, covering topics like consolidation, virtualisation and Parallel Data Warehouse. It’s a great opportunity to show the top people in your company, or your customers, all of the cool new stuff in the world of SQL Server.